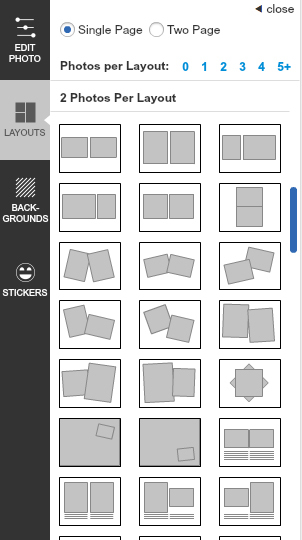 Picaboo offers plenty of pre-designed layouts to choose from when creating your project. You can select from any of these layouts to get started and customize the page further from there, or you can customize your pages from scratch. To apply one of our pre-designed layouts to your page, click on the Layouts option from the Editing Toolbar on the left. 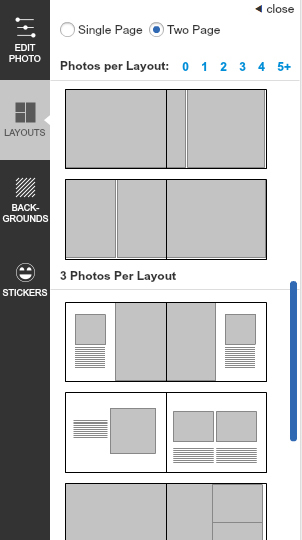 The Layouts tab will appear, and clicking one of the options there will apply the selected layout to your page. You can select from either a single page layouts or two page layouts. You can also click on one of the Photos per page options to jump to the layouts specifically designed for that number of images. What does the “Missing Images” error message mean?